Home / Sale Tips / How Do New Customers Find Your Carpet Cleaning Business? How Do New Customers Find Your Carpet Cleaning Business? Are you marketing your carpet cleaning business effectively? You could be the best carpet cleaning company in town, but that doesn’t matter if new customers can’t find you. If you have a big budget, its easy, just hire an advertising agency. But if you are on a small budget like many of us, your options are limited. However, there are some things you can do yourself that really help. Most people nowadays search online for carpet cleaning companies near them. Make sure you are taking advantage of this. Even if you don’t have a website…and you should…the major search engines and many other websites offer free listings for local businesses. Google, Yahoo, and Bing are some of the more important sites to be listed on. If you find a listing for your company, you can claim it as your own and then update the information within it. If you don’t find your company, you can create a new listing. Each site will require you to either claim or create your listing and then will ask you to verify that you are really the owner. Each site has their own process for claiming and verifying listings. They offer fairly simple instructions, so we won’t go into detail here. You’ll want to fill out the listings as completely as possible, including the business description, category, contact information, hours of operation, payments accepted, etc. The more complete the listing, the more likely the search engines will show it at the top of results. Of all online listings, local business listings by search engines are most valuable because they have the most credibility and are generally displayed at the top of the results page. There are many other sites that offer online listings for local businesses. Generally speaking the more of these sites you are on, the more people will find you. But start with the major search engines and if it’s going well, start adding your company to the other sites. 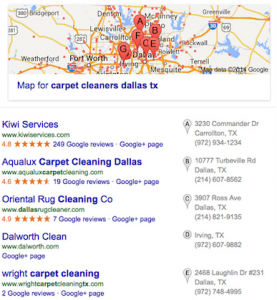 Just go to Google and search for “Carpet Cleaning”, then look through the results for other business directory sites. The ones that show up when you search for carpet cleaning are the ones you need to focus on. TIP: Many listing sites will try to sell you “enhanced listings” or charge you to add your business to “hundreds of sites”. For most small businesses this is just an unnecessary expense. Claim the free listings, avoid the magic pill listing services, and start answering your phone.